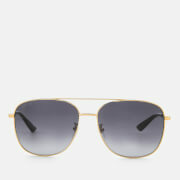 Oversized square frame sunglasses from Gucci’s eyewear collection. 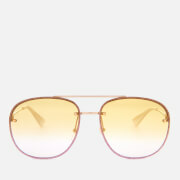 Inset with grey, broad-spectrum lenses adorned with a rainbow-coloured holographic logo design, the sunglasses feature a gold-tone metal frame and bridge with silicone nose pads for enhanced comfort. Fitted with slim metal temples accentuated with soldered interlock 'G' monogram detail and tipped with black, bee-embellished acetate ear pieces. 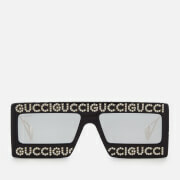 Complete with engraved ‘Guccify’ pattern along the frame edges and branding etched to the top corner of the right lens. Frame Height: 65mm. Frame Width: 145mm. Temple Length: 140mm.